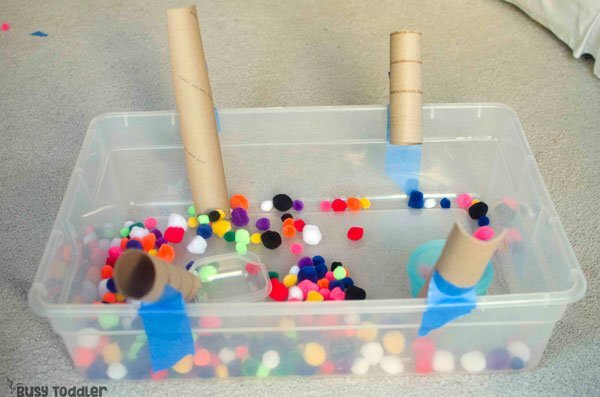 Have some paper tubes to use up? 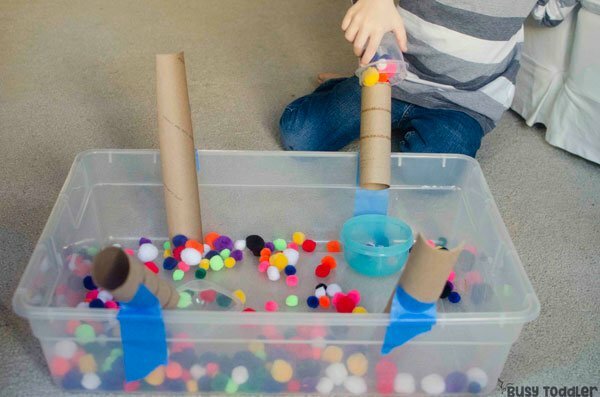 Add “make pom pom ramps” to your list. On a very rainy Saturday, I decided it was time to use the tubes. Well, some of them. 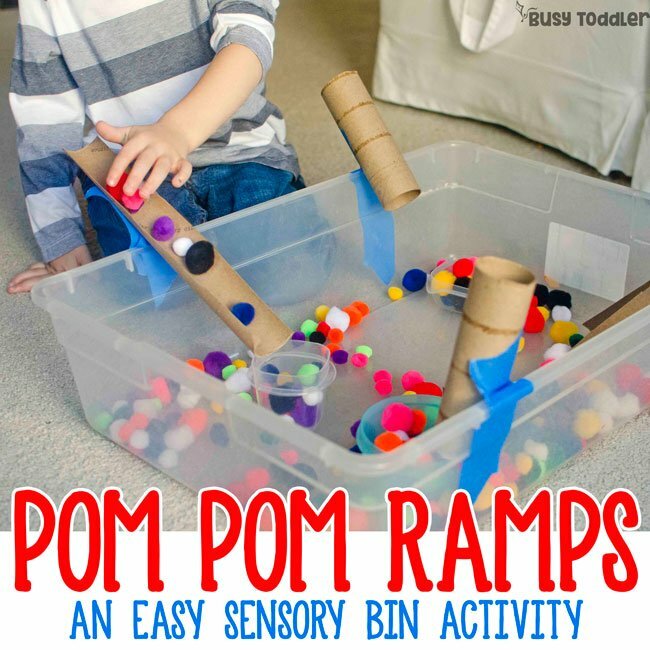 The cutting began, the tape came out, and suddenly we had pom pom ramps: one seriously cool sensory bin. Anyone else have a kid obsessed with pom pom balls? What is it about pom pom balls? Toddlers are obsessed with them. Like little moths to a pom pom ball flame. If I even crinkle the pom pom ball bag, my kids come running. 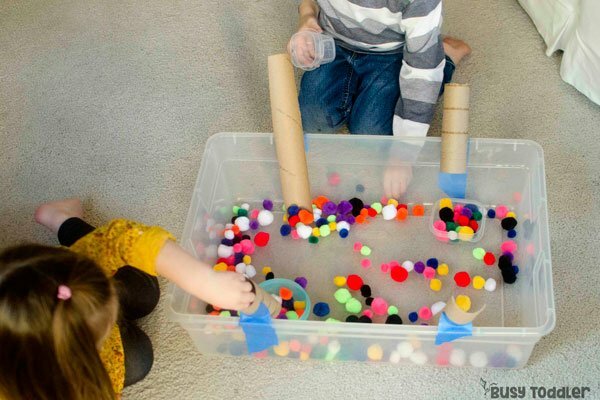 I love a good pom pom ball moment: sensory bin, bath time, and just all around playing. Pom pom balls are the best. 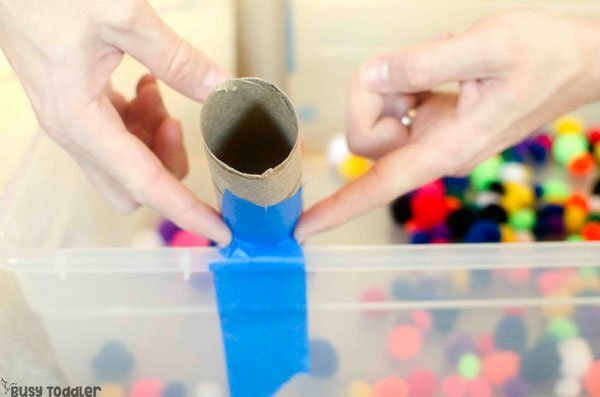 But wait: you need this “trick” to make pom pom ramps. 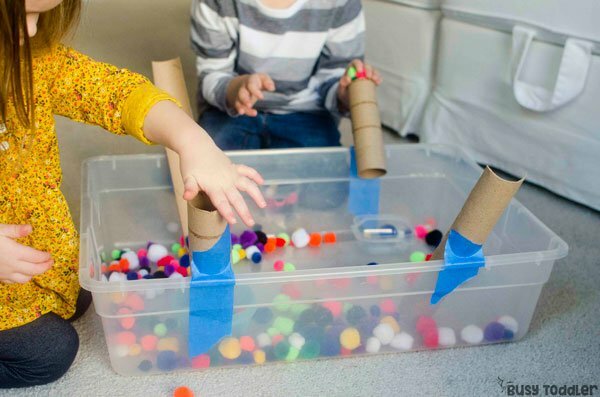 I had the vision for this project but a lack of sleep and basic understanding of physics left me a little stumped on how to make the tubes hook to the sensory bin in just such a way that they made little ramps. Good news is my husband, who is living on a little more sleep and a much stronger understanding of physics, said he’d help bring my vision to life. 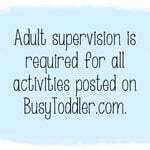 Toddler activities really are a team effort round here. The trick is to put the tape on the outside of the bin and pull it tight. Attach the tube to it and scrunch the side edges to get it snug. I did cut some of the tubes in half length wise so the kids could see the pom poms racing down the ramp. And now, it’s pom pom party time. It didn’t take more than a hot seconds for my kids to realize 1. something was up and 2. something was up and it was going to include pom pom balls. They were circling us to start this activity. 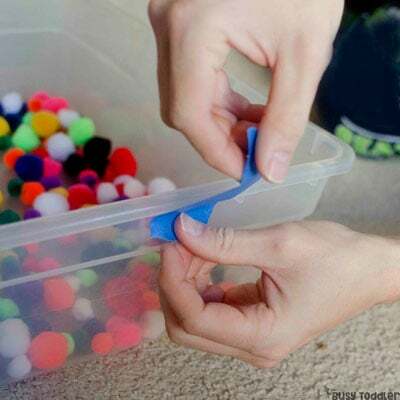 I dumped a giant bag of pom pom balls into the bin along with a few plastic bowls. I figured the kids could use them to “catch” the pom pom balls. We did do a few “test runs” to check the size of the pom poms and make sure everyone would fit. A few of the giant ones were taken out by my 4 year old and deemed too big for ramp play. 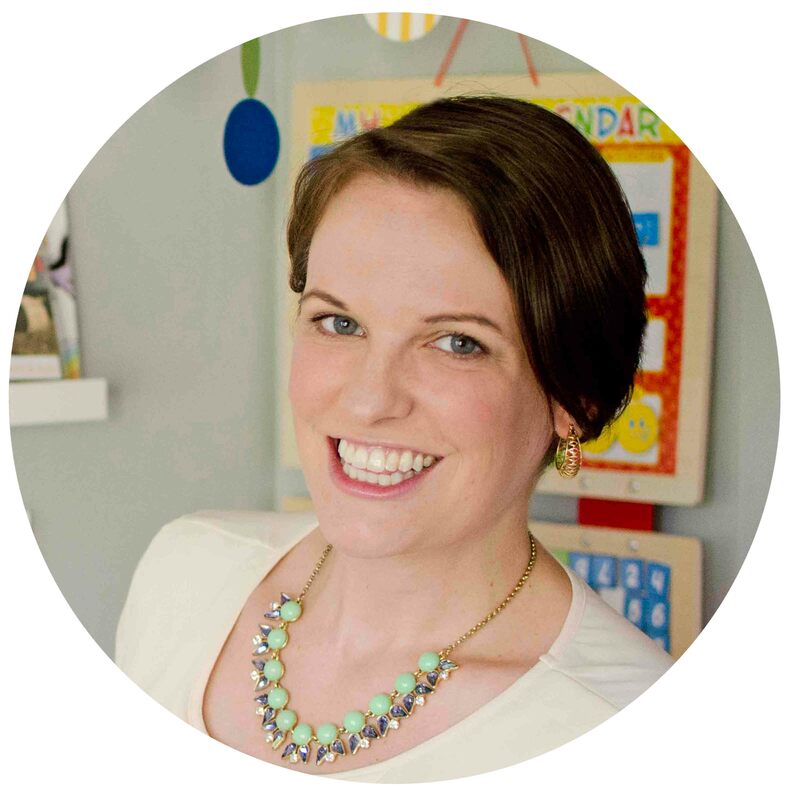 Like I said, it doesn’t have to be a complicated toddler activity to be an awesome toddler activity. 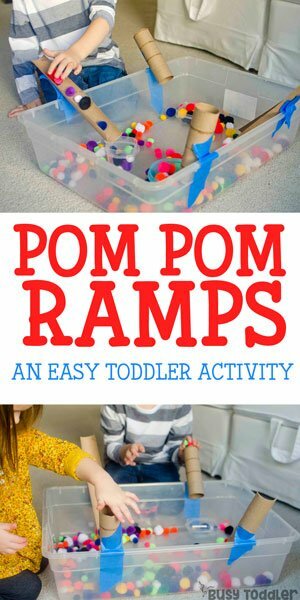 Pom pom ramps were with us for a while – about a week before we needed the bin for another activity and had to move on. But the good news is, I still have plenty of tubes in my collection to play this activity again. 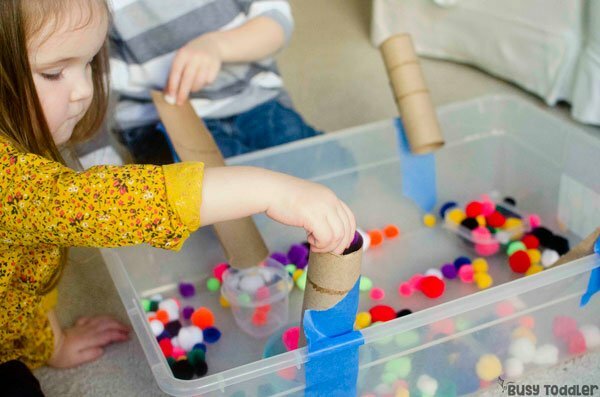 Think you’ll make some pom pom ramps?